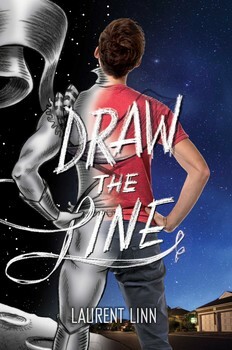 Draw the Line put me in a world I’ve never seen firsthand and it was jarring. Initially, I questioned the novel’s accuracy. I thought, surely this is an exaggeration of what it’s really like for today’s LGBT teens; after all, shouldn’t it be better now? These numbers are deeply troubling and tell me two things: that we still have so much more to do to provide safety and support for LGBT youth and that Laurent Linn’s debut novel depicts a very real lived experience. He shows us the harassment and intimidation that happens in the school hallways and a horrific assault in a strip mall parking lot. He also shows us the aftermath; Kobe, the boy who was attacked, doesn’t return to school even after he recovers from his physical wounds, and Adrian, who witnesses and tries to stop the attack, also misses school, traumatized by the experience and feeling like he will not be safe at school. These plot beats form a believable foundation for the novel, which aids the validity of everything else that follows. This detail about Doug is one of a few things that make him different from his football teammates. Any outsider would peg Doug as the über jock, but internally he feels like an outsider in his group of friends. He can’t share with them his love for comics and cooking. It’s a funhouse mirror image of Adrian, who is literally outside of the gay community, which of course is the exact group of people he should reach out to. Linn plays with the ideas of loneliness and isolation within small social groups. Through Adrian, Linn shows that there is power in finding and making connections to other people, that you shouldn’t close yourself off to the world because you assume that the world won’t accept you. In a way, this wasn’t just Adrian’s journey, it was about a group of friends who find each other through challenging circumstances. Ultimately, this is a very sweet, idealistic, and aspirational text. The inclusion of Adrian’s art is crucial to the development of his narrative voice. It’s consistently written but being able to see him express his emotions through art makes those emotions explicit and literal without having to spell them out with words. Adrian’s transformation from a passive bystander to an active participant will move many readers. As Karyn has asked herself this season, would I nominate it? There’s simply not enough here for me to build an argument for serious literary merit. All the elements are executed well but the book lacks the sophistication that you would expect in a Printz-worthy novel. Now, if we were Someday My Morris Will Come (I guess that doesn’t really work, does it?) I wouldn’t hesitate to nominate and I can’t wait to see what Linn does next. How about you, dear reader? I feel like this might be a heart book for some of you, so speak up and tell me why this one might be a head book too. So glad you enjoyed this too, I feel it’s a shockingly good first novel and perfect Cat Nip for the Morris which would be a good title for that blog! Linn was on a panel at Bookfest last weekend and he was a stand out, I think we will be seeing a lot more of him in the coming years. I, too, was deeply affected by this book for the jarring details about the bullying. I loved the superhero take on the story and the diagrams. But I was put off by Adrian’s inability in the beginning to say no to the bully on s personal level. Disturbing.